Top tip: use reference lists from dissertations to help inform decisions on which are the most important journals. Idea of restricting ebook access to subject groups of students to reduce costs, but higher risk of breach of licence (if the “wrong” students gain access), and reduced opportunity for interdisciplinary work if readers can’t access texts outside their field. Helsinki Uni Library’s online acquisition proposal form for students & academics to make recommendations. They also use patron-driven acquisition (PDA) and evidence-based selection (EBS). We discussed the legal/logistical issues around selling deselected books to students. I liked the idea of using the money raised to buy plants for the library! Terkko Navigator – an excellent site. It’s a single search interface with all the usual info sources, plus library and academic staff profiles, and RSS feeds. Please will a funding body give @Terkko money to make the system open source so we can all use it? The journal and database functionality is powered by SFX and MetaLib, the rest is built in-house. Various journal metrics are displayed alongside journal titles. Eevaliisa Colb’s presentation on Digital Libraries Now. ‘More with less’: In IT, anything is possible; but we must prioritise – we can’t do everything for everyone. Layers of authentication for Helsinki Uni e-resources: Shibboleth-type single sign-on is widely used (Haka is the Finnish uni federation), and IP address access too. As in the UK, there is a mismatch between the potential granularity of SSO and the reality of ‘authorised user’ clauses in most e-resources licences. 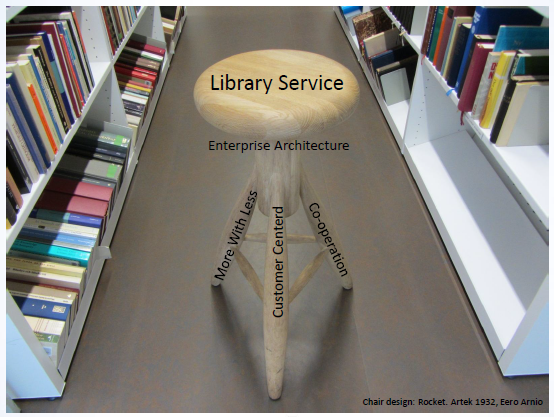 Importance of informal contact and regular communication between library & IT in working well together. It was reassuring to learn that many of our e-resources issues are common to all our countries. For example, licence compliance; especially when tech or Uni business model exceeds imagination of the licence.